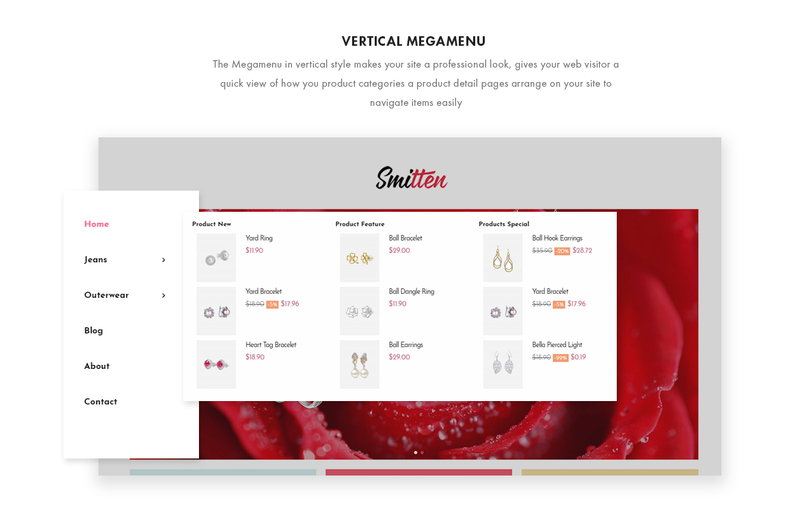 Leo Smitten is a minimal Prestashop theme. 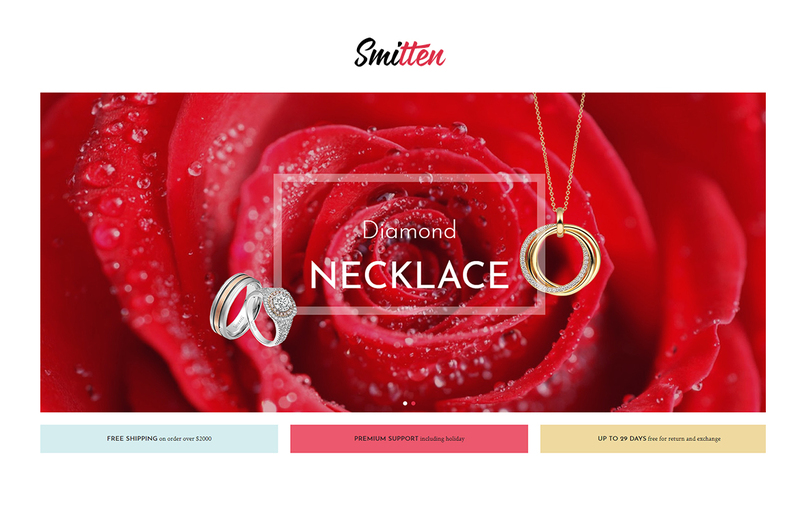 With the modern look with the charming red main color, Leo Smitten can be applied for any E-commerce websites to sell products like jewelry, necklace, rings, flowers, gift, fashion and accessories. Leo Smitten comes with responsive design so it looks stunning and completely adjustable on any devices like mobile, laptop, computer, which allows your clients to visit and shop conveniently on whatever devices they have. 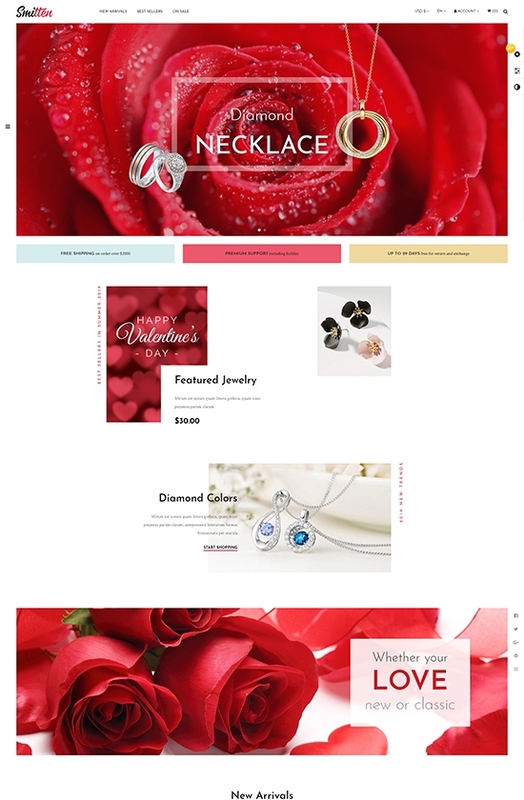 Leo Smitten for Jewelry store is attractive with creative layout, which is created by the flexible banners and image blogs on site. 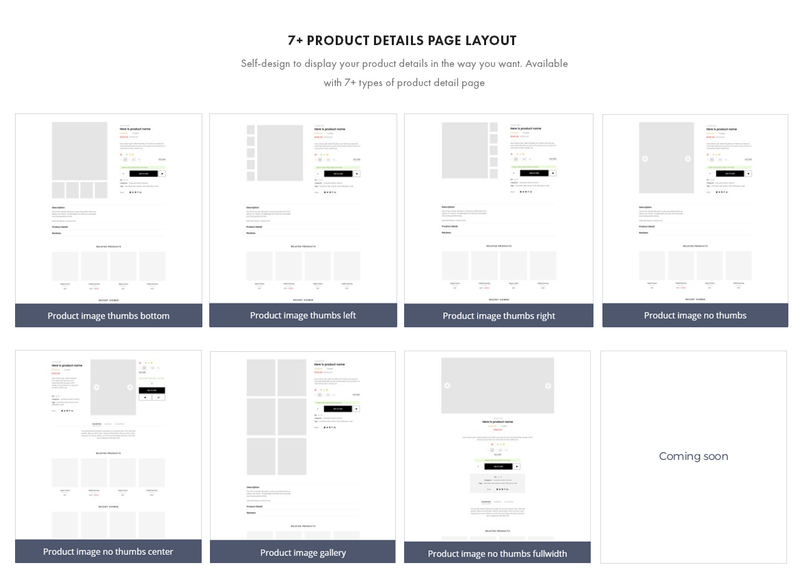 The whole page is integrated with suitable effects to give you a smooth sense for each down-scroll to discover the entire page. 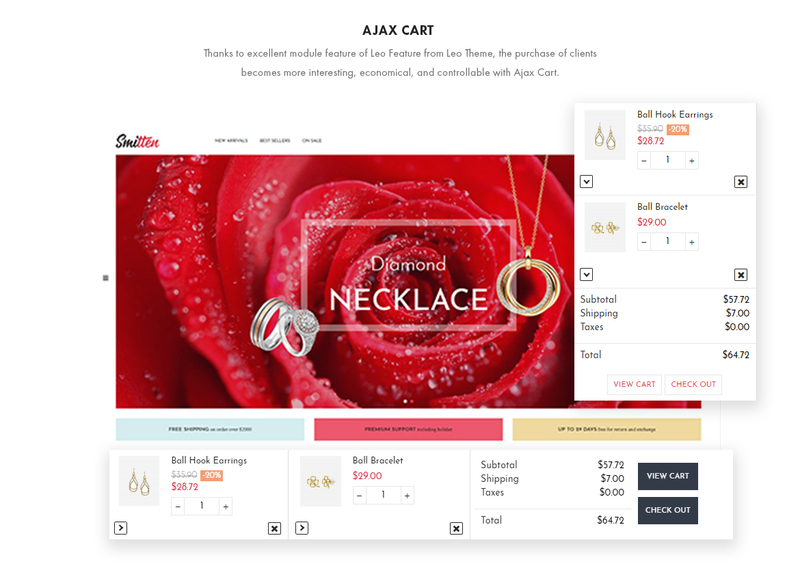 Being built on the best Prestashop Framework and the latest version Prestashop 1.7.5, Leo Smitten Jewelry Prestashop theme is the perfect combination of powerful modules. 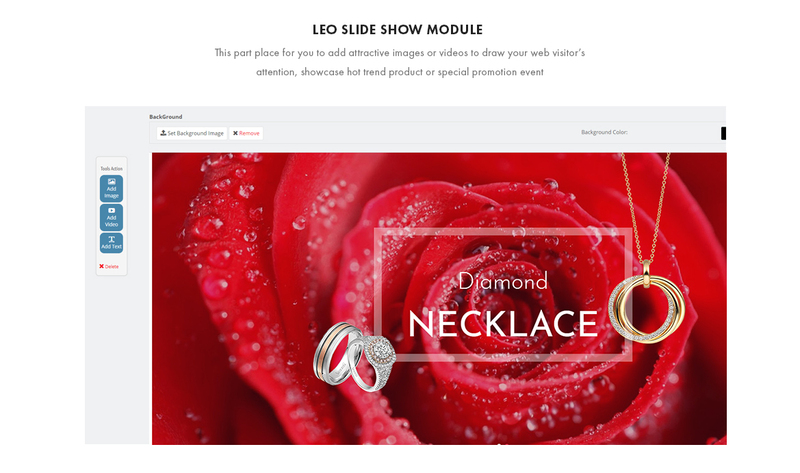 It is to mention Leo Slideshow, Leo Mega menu in vertical style, Leo Feature that comes with greatest user utilities like Add to Cart, Quickview, Add to Compare, Add to Wishlist. 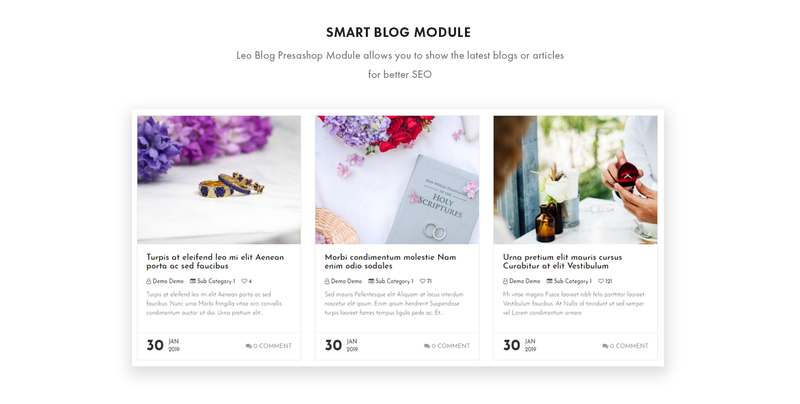 Moreover, the smart Blog module makes it possible for you to share useful blog or article with your client about what you sell on site. 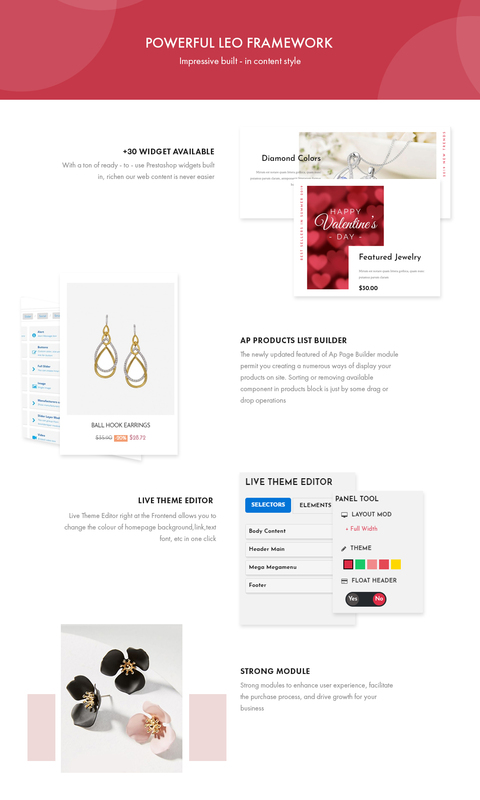 Especially, by Drag n Drop Page Builder, the content & layout builder is in your hands. 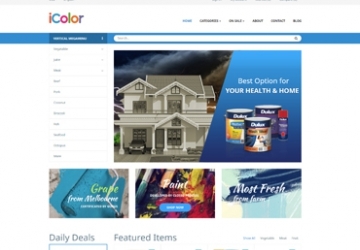 It's possible to create both Homepages, Category, Product Detail, Blog Page. 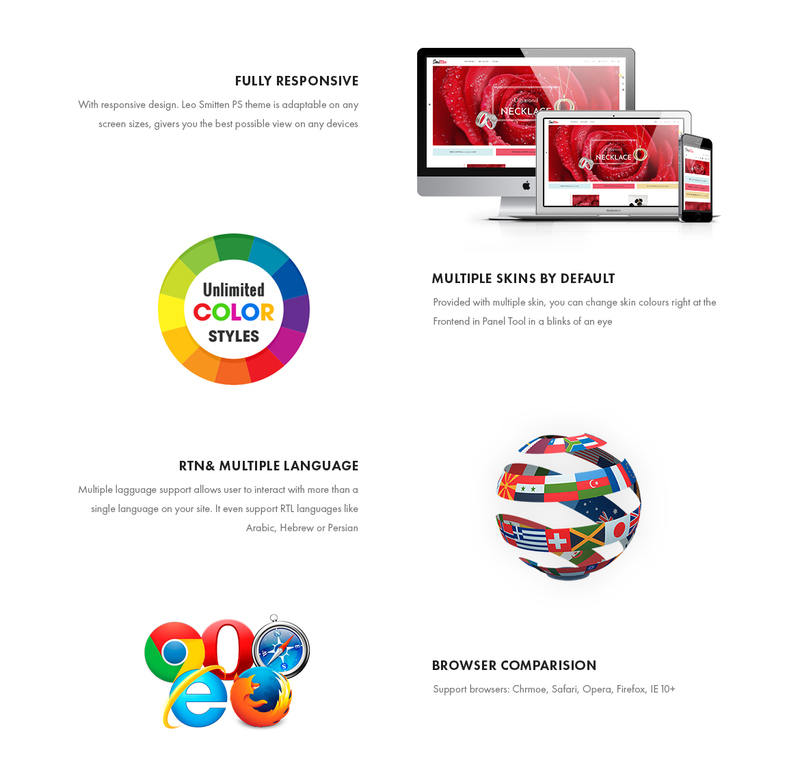 In addition, Leo Smitten responsive theme is born with top-notch technology. 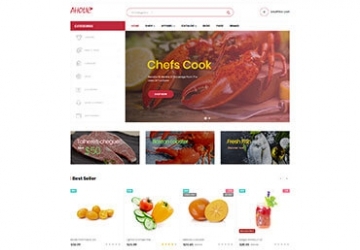 Being optimized for SEO, Speed & other advanced technical support, your customers will have great chance to experience on a professional website to increase more satisfaction & boost sale sharply. Multiple Languages & Currencies, RTL & Translation will make Leo Smitten the best choice. 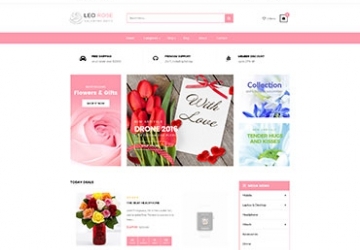 What makes Leo Smitten Responsive Prestashop Theme special?